Boston, Mass - As I was researching the Boston City Guide last year, I did a series of posts on Cool Boston Ladies, which included Anne Hutchinson and Mary Baker Eddy. It was a good idea, but sorely incomplete. How in the Hub could I do a series entitled "Cool Boston Ladies" and leave out Isabella Stewart Gardner? A prominent member of Victorian-era society, this lover of art, music, gardens, travel and baseball dedicated her life to pursuing her passions - and sharing them with others. She did so by building a Venetian-style palazzo right here in Boston, filling it with priceless artwork that she had acquired on her worldwide travels, decking the courtyard with seasonal blooms, and welcoming the public into her home for concerts, exhibits and other gala affairs. The Isabella Stewart Gardner Museum is still an exquisite way to spend a day (or an evening). I was there a few days ago to admire the Hanging Nisturtiums. 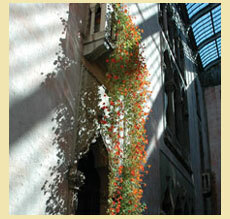 Mrs Gardner's favorite flower, these orange blooms drape the courtyard every April in honor of her birthday. (She was born 170 years ago today.) The four-storey garden courtyard is always an oasis, but it was absolutly stunning in its birthday suit. This is the first time I have been to the museum since my stint in Venice, so I was thrilled to discover how the palazzo reflects Mrs Gardner's love for La Serenissima. From the outside, the building is rather plain, so you forget that the arcaded interior evokes the Doge's Palace on the Grand Canal. Even her art collection hints at her affinity for the Italian Renaissance. Truthfully, the artwork spans the globe, especially sculpture from Ancient Rome and Greece (the ultimate in garden art), extensive paintings by Dutch and Italian masters, and a few prominent pieces by American artists (who were her acquaintances) Sargent and Whistler. But it's clear that the art of the Renaissance captured Mrs Gardner's heart and soul - as evidenced by pieces by Giotto, Botticelli, Titian and Raphael. 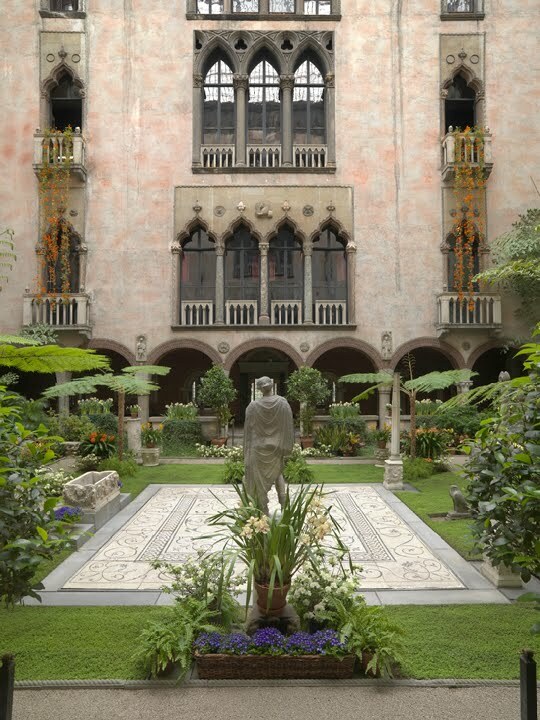 Aside from the art and architecture (and music and flowers, etc etc) the Gardner Museum is all the more enticing as it is surrounded by intrigue. Exactly 20 years ago, the museum was the setting for a legendary art heist. On March 18, 1990, two thieves disguised as police officers tricked the security guards and left with nearly $200 million worth of artwork. The most famous painting stolen was Vermeer's The Concert, but the loot also included three works by Rembrandt, and others by Manet and Degas, not to mention French and Chinese artifacts. The crime was never solved. Mrs Gardner's will stipulated that the collection remain exactly as it was at the time of her death. So the walls where these paintings hung remain barren, even today. Meanwhile, the Gardner Museum continues to offer a $5 million reward for information leading to the recovery of the artwork. So if you have any leads, please let me know. The palazzo at Fenway Court has remained almost exactly the same since its opening in 1903. Even after Mrs Gardner died in 1924, the museum continued to display her artwork and host concerts just as it had during her life, according to her will. Her living quarters on the top floor were converted into administration, but little else changed. It's not evident from the inside, but the Gardner Museum has undertaken an enormous expansion project, knocking down the old carriage house to make way for a striking modern addition designed by Renzo Piano. It's obviously a controversial move, evoking protests from the Fenway neighborhood association and other traditionalists. But the museum administration feels the expansion is necessary to maintain the vibrancy of the institution. Apparently the collection will remain intact, and the new space will be used for temporary exhibition space, concert hall, cafe and office space. The Massachusetts Supreme Court approved the deviation from the will, so the expansion is moving rapidly forward. The rennovation is scheduled to be completed in 2012. So visit the palazzo now, so you can say you remember what it was like back in Mrs Gardner's day. 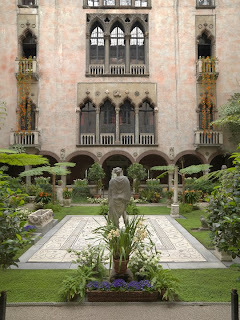 Photos courtesy of the Isabella Stewart Gardner Museum.